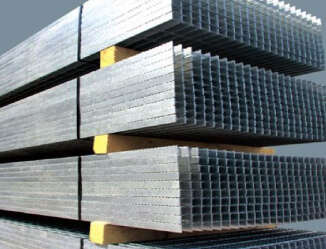 Steel grating or open mesh flooring is available in galvanised or self colour finish. Standard panels are 6000mm x 1000mm and these open flooring panels are often used to increase safety and to increase drainage in outdoor areas. Open flooring panels can massively increase safety on many industrial sites, reducing risk of slipping and other potential hazards. These types of panels also greatly increase drainage on sites due to their open design. Our open mesh flooring can be galvanised to further increase the utility of these panels in outdoor environments. Galvanisation involves applying a protective zinc coating over the produced steel in order to combat steel’s weakness to corrosion. In many industries floor safety is essential therefore steel grating is an extremely sensible investment. Combining the strength and longevity of steel with excellent drainage and protection, steel grating is an impressively useful product. South West Steel offers a wide array of open flooring panels. If you are looking for these products and wish to see dimensions and prices then do not hesitate to contact us today for a free quotation.